Half Square Triangle Units – Fast and Multiple – Tutorial. Half Square Triangle Units can be a terrific addition to any quilt. 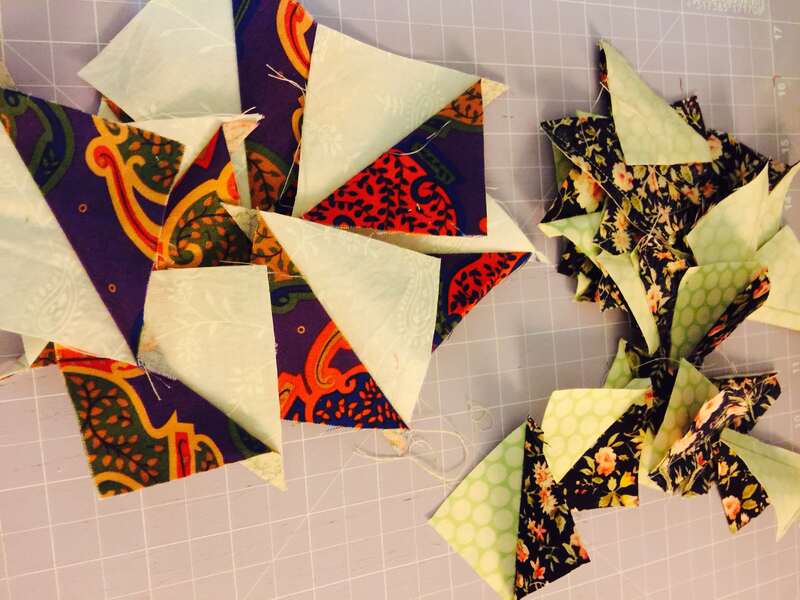 They can be the whole quilt, or units within a block, or wonderful border additions. The possibilities are practically endless. But they do require some extra work. Especially if small units is what is required. So the question is how do we get there? 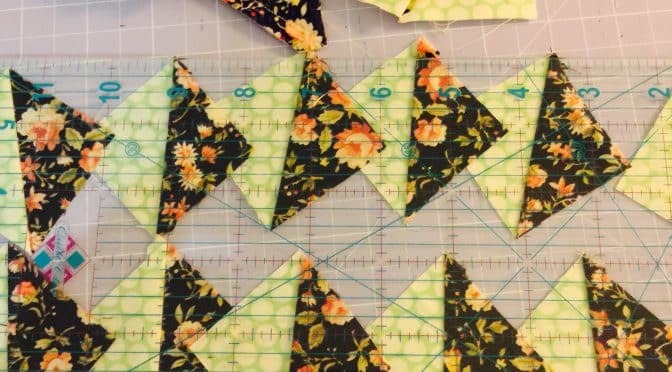 There are lots of tools, gadgets and templets available for quilting and of course, use them by all means. I rather favour not being too dependant on gadgets and frankly I have some in my collection but rarely use them. I like to come up with easy and inexpensive solutions with things already available. 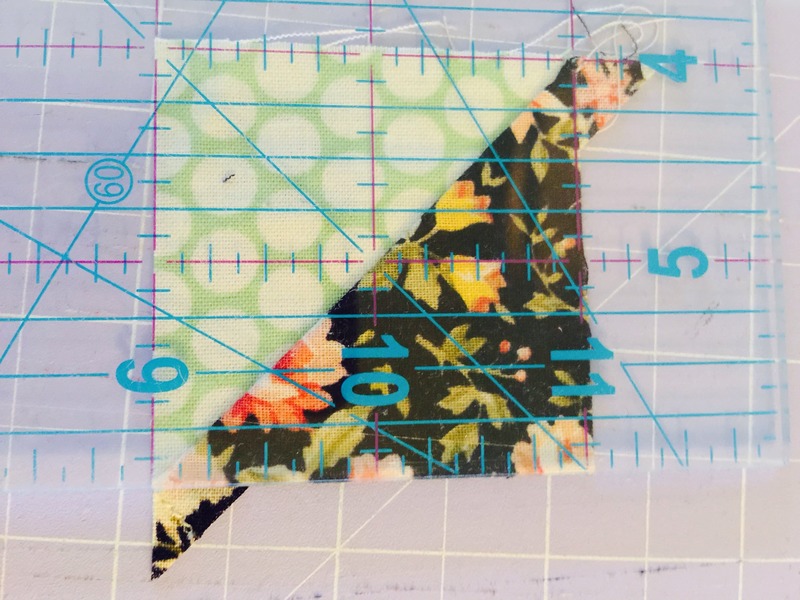 So what could be easier than using 5″ Charm squares to make multiple 2″ Half Square triangle units. 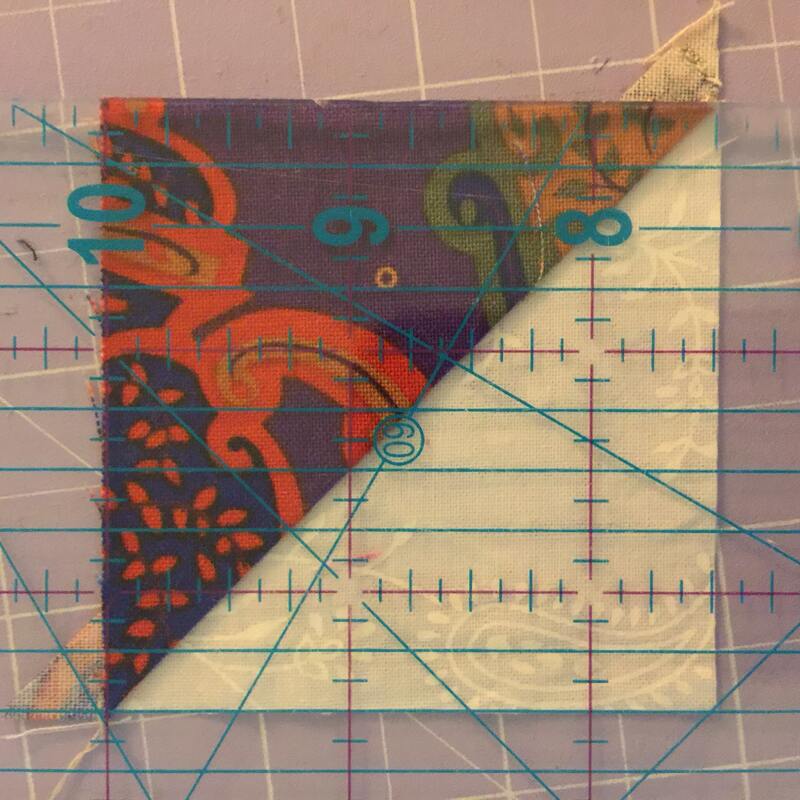 I always have plenty of 5″ squares on hand. Suddenly a lot of units can be made quite quickly, without waste or fuss. 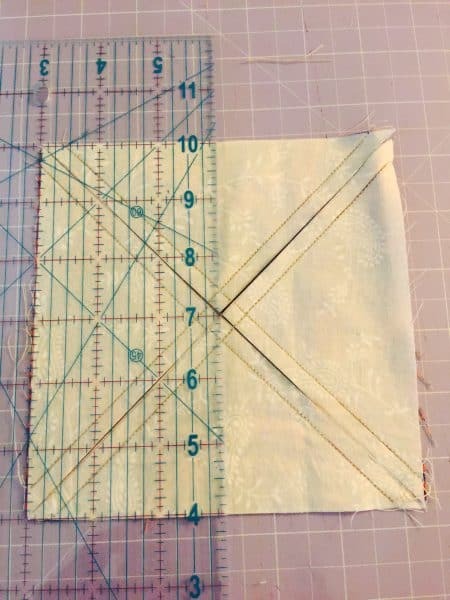 This method also ensures that there are no bias seams on the outside of the units. I do recommend making some test units first to check seam allowances. Here is how I do it. 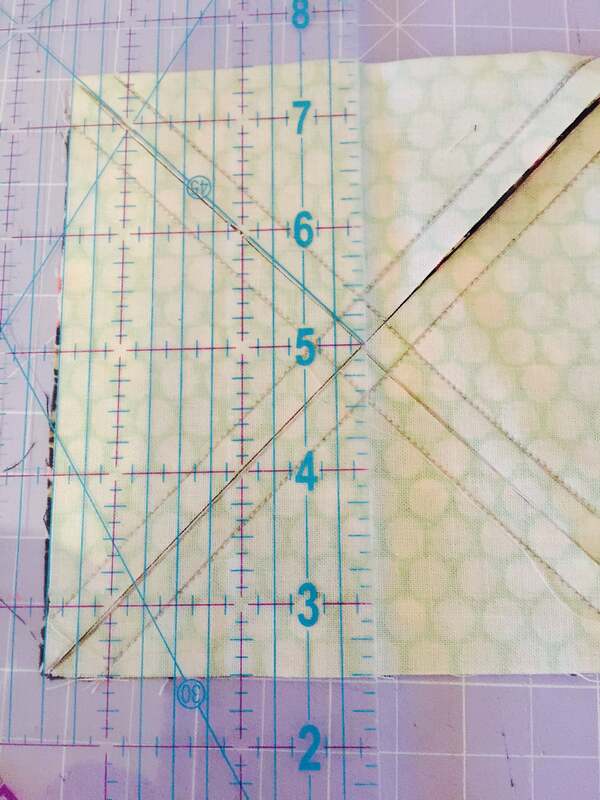 I do use a 6″ x 12″ clear quilting ruler. Take two 5″ Charm square, one light, one dark. 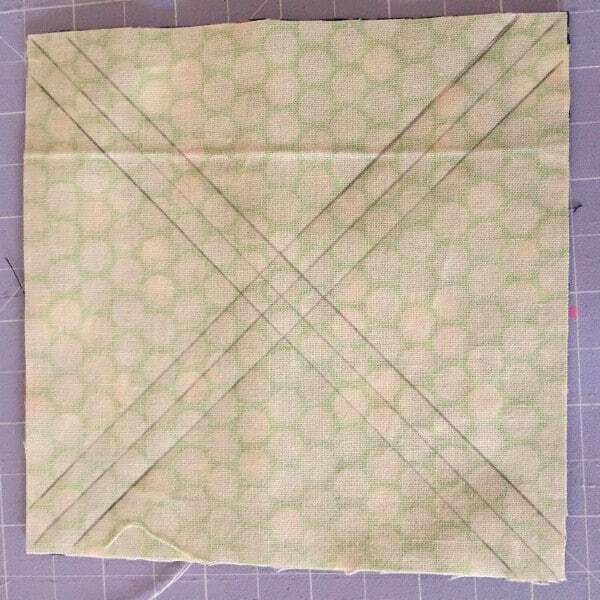 With a pencil, draw two lines on both diagonals on the back of the light square. 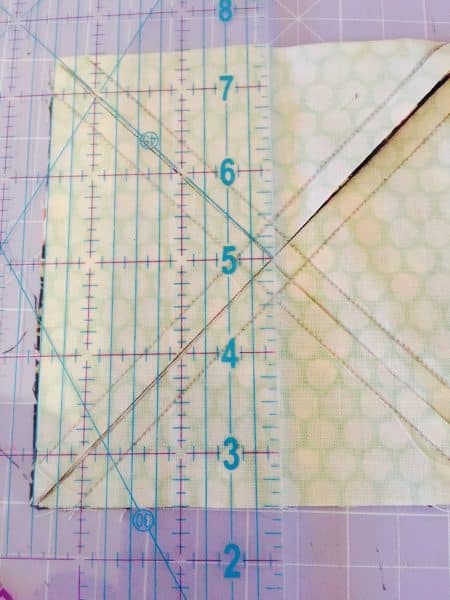 Using a quilting ruler, line up these diagonals with the 1/4″ mark and make a second set of lines on each side of the initial diagonal lines. Sew on the outside lines on each side of both diagonal lines. Carefully cut the unit along the centre diagional lines and then into quarter squares lining up with the 2 1/2″ mark on your ruler. There you have it. 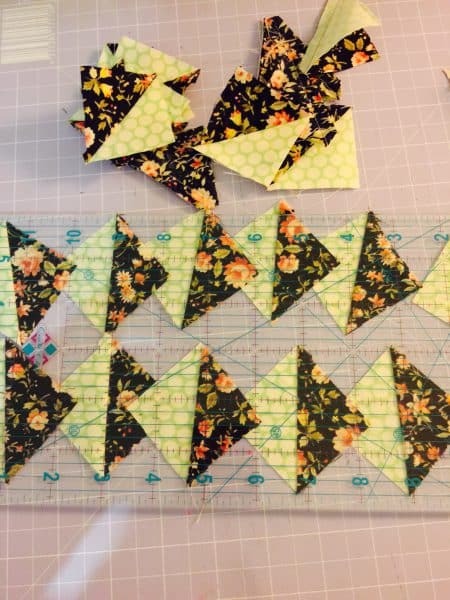 Eight half square triangle units. 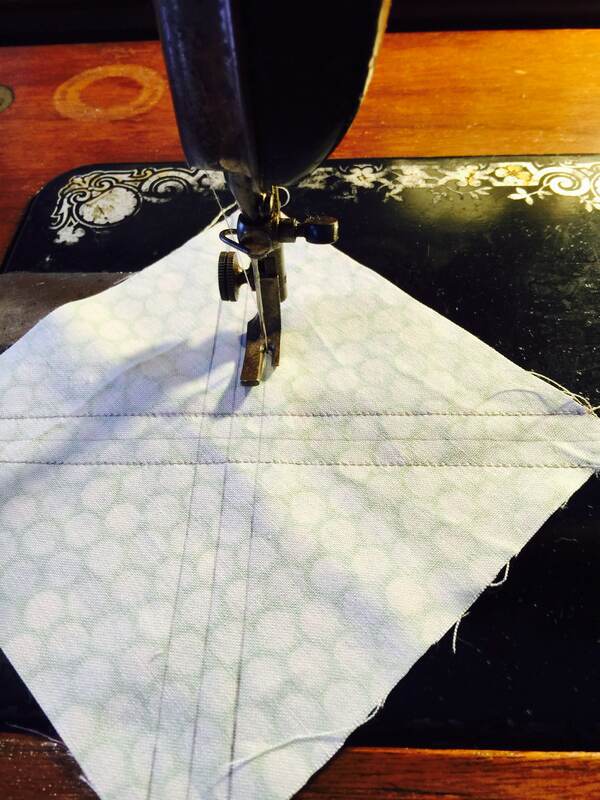 Open up an press seam to the darker side and trim off the doggy ears. After many units have been made, the doggy ears can be trimmed later if preferred. A good evening or TV job. If you would like to make 2 1/2″ Half Square Triangle Units, begin with 6″ squares, one light and one dark. Repeat at all the steps as above. Multiple 2 1/2″ Half Square Triangle Units. Here are some 2″ and 2 1/2″ units.